Pro Rail Services Ltd. is a Railway civil engineering contractor who execute maintenance contracts on Network Rail infrastructure. These call-out works took place on the Thameslink Route. This was an emergency call out from Lanes Group Plc, who were working for Thames Water after a Thames Water 16 inch water main burst on Friday 23rd January. 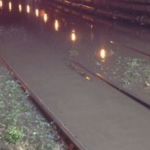 Network Rail teams initially attempted to resolve the flooding in Farringdon Tunnel over the weekend of 24th26th January, but were unable to find a workable solution. The Pro Rail Services Ltd. response team met on site with both the Themes Water Network Engineer and the Network Rail Permanent Way Engineer to discuss the scope, access and to agree on achievable objectives for the next 48 hours. Within 90 minutes of arriving on site we obtained the track drainage layout plan from TfL as none were available on site. In parallel and working closely with both the Network Rail Permanent Way Team and the Signaller, access was obtained to facilitate the laying of hoses and the placing of pumps in the catchpits, with the outfall point identified from the TfL plans. 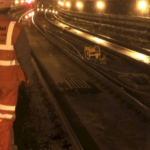 Teams were set up on 12 hours shifts with monitoring systems implemented so that tunnel flooding reduction could be assessed by the Pro Rail Services Ltd. Engineer, who, in turn, communicated progress to both stakeholders. The pumping solution – using pumps, hoses, generators, Jet-Vac tankers and CCTV equipment – took 4×12 hour shifts to de-water the flooded tunnel. The team consisted of a competent drainage engineer, COSS, lookouts, and four skilled drainage operatives fully trained for rapid response scenarios. It was estimated that circa 500,000 litres of water had been removed from the tunnel in this period. This entry was posted on April 30, 2018 by robsmith41.